The player, taking on the role of an Israeli or Palestinian leader, tries to bring peace to the Israeli-Palestinian region before their term in office ends in the game PeaceMaker. Although first released about 10 years ago, the game PeaceMaker (created by Asi Burak) remains relevant today as it isn’t anchored in a specific time frame, but rather telling of the general climate and the complexity of relations in the Israeli-Palestinian region. The player’s goal is to achieve peace through their actions as either the Israeli Prime Minister or the Palestinian President, and both factions present unique challenges in the game’s three difficulty settings (Calm, Tense, or Violent). The interface comprises a map of the region, with each city clickable for a small description. The player can view their standing with different groups and leaders (the Palestinian and Israeli publics, the USA, the United Nations …) and learn more about them: the nature of their political power, their goals and fears, as well as the possible actions they might undertake. The polls inform the player of the impact of their actions in relation to the economy, the public’s trust in their leadership, the suppression of militant activity, etc. Two scores, always visible in the bottom of the screen, represent Israeli and Palestinian approval in the Israeli Prime Minister playthrough or Palestinian and World approval in the Palestinian President playthrough. To win—or achieve peace—both meters must reach 100, whereas a -50 score means failure. The winning solution, in PeaceMaker, is a two-state solution. The player’s actions determine whether the meters go up or down. They can choose between over 60 actions divided into three branches (Security, Political, and Construction) and seek advice from their national and foreign advisors (Palestine) or from the Hawk and the Dove (Israel). These advisors represent the dual perspective the player has to contend with. Each action is followed by a response screen, which reads like a news excerpt using real-life images since the game is inspired by real events in the Israeli-Palestinian conflict. Periodically, negative, neutral, or positive events pop up on the map following these responses: These can be, for example, citizens protesting in the streets, a suicide bomber killing innocent bystanders, or a militant group supporting partial disarmament. As both approval meters go up, the player reaches different milestones toward Palestinian independence and toward peace. However, it is difficult to understand these milestones in regards to the actions the player undertook. 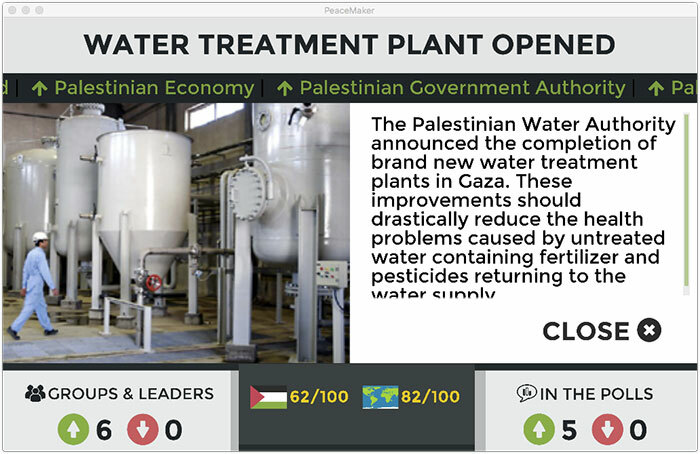 If the Gaza Strip has been liberated, is it because the player built water treatment plants and other infrastructures, or is it simply because the “Cooperation” meter has reached a certain level? In this sense, the milestones don’t provide much feedback. When I played PeaceMaker, I would have appreciated if the game included a history of all our past actions in order to get a global overview of the politics during my playthrough. PeaceMaker doesn’t explain the source of the conflict between Israel and Palestine, and, except for a timeline showing major events, doesn’t go over its history. However, it succeeds in showcasing the hurdles both leaders must overcome to build a consensus with the population and with other groups and leaders. The player understands that their actions will seldom please everyone and that some factors are out of their control. Indeed, both the Israeli and Palestinian leaders must deal with factions on their own side whose ideologies or methods might not align with theirs. In PeaceMaker, it is understood that “the other side wants peace too,” and as such the game offers a comprehensive overview of all perspectives. PeaceMaker, available on desktop and mobile, can be purchased for $2. Considering the violent nature of some of the images and footage, it should be preluded by a discussion with students about the conflict. As a note, Impact Games considers PeaceMaker to be PG-13, but the App Store requires players to be at least 17 years old to download the game (it has a “Teen” rating on Google Play). 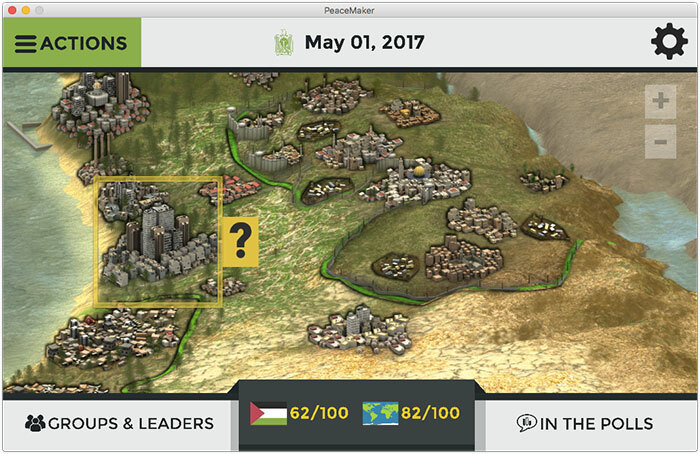 PeaceMaker is a well-made, thought-provoking game that offers students an opportunity to reflect on the Israeli-Palestinian conflict and on the conditions necessary to achieve peace in the region. Through their advisors’ words and the various events and responses, students will gain a better understanding of the various factions’ motivations, which will enable them to develop empathy for all people affected by the conflict and understand world events more deeply.